SK hynix has announced that it will be ready to start early stage mass production of its so-called 4D NAND Flash before the year is out. In a press release the memory making specialist says that its new 96-Layer 512Gb chips utilise CTF based 4D (Four-Dimensional) NAND Flash (4D NAND) based on its TLC (Triple-Level Cell) arrays, using 3D CTF (Charge Trap Flash) design paired with the PUC (Periphery Under Cell) technology. Each of these chips provides 64GB of storage. Calling the memory structure 4D is rather a stretch but SK hynix has done this to highlight the combination of 3D CTF and PUC “for the first time in the industry”. One difference is the use of CTF – Intel and Micron use floating-gate technology instead. But the biggest difference in this 4D NAND is down to the PUC technology which brings the flash cell supporting circuitry beneath each respective cell, rather than adjacent to it on the silicon. 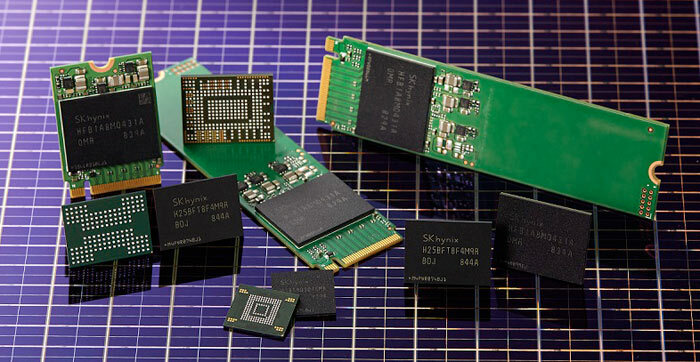 SK hynix reckons that change adds a dimension to its NAND. Benefits of the new 96-Layer 4D NAND Flash from Sk hynix are numerous, according to the company. First of all, and most obviously, the structure facilitates a reduction in chip size of > 30 per cent. A knock on effect is that bit productivity per wafer by is up 49 per cent compared to the SK hynix’s 72-Layer 512Gb 3D NAND. Performance is also said to be significantly upgraded. SK hynix claims a 30 per cent higher write and 25 per cent higher read performance with the new 4D NAND tech. Data bandwidth “is doubled to the industry’s biggest 64KB (Kilobytes)” and “data I/O (Input Output) speed reaches 1,200Mbps (Megabits/sec) at 1.2V (Volt) of operation power”. Before the year is out SK hynix says that it will be introducing 1TB (Terabyte) client SSDs equipped with 96-Layer 512Gb 4D NAND, and its own controllers and firmware. It also plans to leverage the new 4D NAND in UFS (Universal Flash Storage) 3.0 for the mobile market in H1 2019. Going forward, SK hynix says it will bump up the density of its 4D NAND to produce 96-Layer 1Tb (Terabit) TLC and QLC (Quad-Level Cell) in 2019. So… it's like a TARDIS? I'm glad they cleared up CTF before I had to look it up though. I could imagine lots of electrons running around trying to grab the flag off other electrons, but couldn't see how that helped in data storage. Sounds like a win win, increasing production efficiency and performance. With the developments in SSD i dont know why HDD technologies are still being developed to be honest; seems like only a matter of time until their only advantage, capacity, is superseded by SDDs. I'm glad they cleared up CTF before I had to look it up though. So those were the shady looking people outside my place!